Come experience the latest innovations in digital signage at Integrated Systems Europe 2019! signageOS will be exhibiting at Booth 8-N410 and we look forward to you stopping by. The purpose of releasing signageOS Open to CMS companies for free is to eliminate the issue of hardware/software compatibility in digital signage. This issue has loomed over the digital signage industry and was one of the main arguments against using SoC displays for digital signage. The “marrying one solution” argument will no longer be valid. Utilize the JS API for content features like accelerated video playback, offline file management, synchronized playback, etc. Utilize the development SDK, documentation, and knowledge base to expand CMS providers integration expertise. One question we have been asked many times, and rightfully so, is how will signageOS continue to make money if this product is offered to CMS companies for free. signageOS will continue to offer the signageOS Platform services that consist of some highly beneficial features like support, maintenance, customization, device monitoring and reporting, alerts, full device management using the signageOS REST API, and much more. 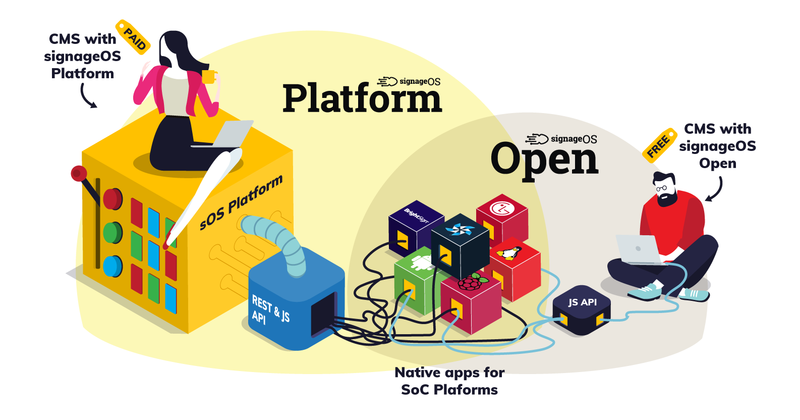 CMS companies can integrate signageOS Open into their networks, increase their market share by offering any SoC display or media player, AND, in case of any digital signage emergency, use signageOS’ paid features and integration know-how for assistance with each and every platform. signageOS is currently in testing with selected partners but will launch April 1st, 2019. Never before has the digital signage industry witnessed a product of this magnitude so reactions from major players were crucial to the success of this technology. signageOS Open is the answer to CMS companies who are looking to integrate large networks of any smart display or media player without the tremendous amount of time and cost of developing those integrations. This low effort, high impact offering has the potential to dramatically increase CMS companies' market share by allowing them to take on complex networks with varieties of device types. This contemporary take on the standardization of digital signage display integrations has never been offered to the digital signage industry before. signageOS is tremendously excited to offer this technology and to be a part of its impact on the digital signage industry. Join signageOS today and become a part of the latest innovation in digital signage.